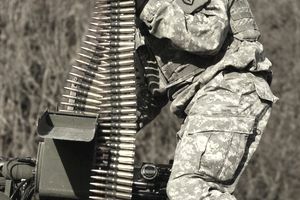 Ammunition, explosives, their components, and weapons are known in the Army as "ordnance" and require highly specialized care when dealing with them. Ammunition specialists oversee all aspects in the management of ordnance. They handle such weaponry as conventional ammunition, guided missiles, large rockets, explosives, and other ammunition- and explosive-related items. A lot of what these soldiers do involves blowing up expired or partially used explosives and other ordnance in controlled settings. While that may sound like fun (and it can be), it's also a crucial part of keeping troops safe. MOS 89B is considered part of the U.S. Army Ordnance Corps, a unit that supplies combat units with needed ammunition and weapons. The Army categorizes the job of ammunition specialist as military occupational specialty (MOS) 89B. These soldiers assist with all aspects of handling explosives; they receive, store, issue, maintain, modify, destroy, and demilitarize such items. They perform ammunition supply stock control and accounting duties and operate material handling equipment (MHE) to maneuver ammunition. In addition, they supervise lower-grade soldiers and provide technical guidance. They assist in the preparation of ammunition, ammunition components, and explosives for transport. Job training for an ammunition specialist requires 10 weeks of Army Basic Combat Training (boot camp) and 12 weeks of Advanced Individual Training (AIT). This job-specific training takes place at Fort Lee in Virginia. This is a field where promotions tend to happen at a fast pace, so if you do good work and keep your nose clean, there are likely opportunities for advancement in a short period of time. If you're interested in this job, you'll need a score of at least 91 in the skilled technical (ST) area of the Armed Services Vocational Aptitude Battery (ASVAB) tests. You also have to be able to qualify for a confidential security clearance from the Department of Defense. This is the lowest-level security clearance available to U.S. military personnel, but still involves a background check of character and finances and a check of any criminal records. A history of drug or alcohol abuse may be disqualifying. Candidates for this job must be U.S. citizens and have normal color vision (no colorblindness). You can't have allergies to explosive components, and you can't have claustrophobic tendencies to serve as MOS 89B. While much of this job is specific to the Army without an exact civilian equivalent, there are some postmilitary career options for soldiers trained as MOS 89B. You may be qualified to work for construction companies that use blasting equipment and explosives, or as a supervisor or manager of mechanics, installers, or repairers. Another area where your Army skills will prove useful is in the occupational health and safety field, where you may find work as a technician.